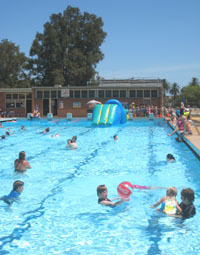 This website supported the community struggle to maintain the Mayfield Swimming Centre from 2007, when Newcastle City Council first proposed to close it, until 2013, when its future was secured through a long-term management contract with a private operator. This site is no longer actively maintained, but it is preserved here in legacy, as a history of the events as they unfolded around Mayfield Pool, and to document this example of a successful grassroots community campaign. Come and Enjoy Mayfield Pool! Mayfield and the wider Newcastle community are fortunate to have the Mayfield Swimming Centre as an essential community resource. Originally a gift from BHP in exchange for the loss of Shelly Beach on the river, the pool has served the community well as a sports and recreational facility for decades. With an olympic pool, a children's pool, play equipment, a kiosk and a large grassy area with barbeque facilities, Mayfield Pool is a terrific venue for a wide range of activities. You can keep fit under your own steam or join the Premier's Swimming Club (see below). You can help your kids to gain confidence with their swimming in a fun, supervised environment. Or the whole family can spend the long summer days relaxing in this idyllic spot. Inflatable slides are regularly operated during summer, ring to check for details. Mayfield Pool is also the focus of several special events during the season. In response to Newcastle City Council's Draft Delivery Plan, the Save Mayfield Swimming Pool Campaign (SMSPC) has submitted a proposal to Council. It identifies several problems with entry pricing policy for inland pools, and proposes a market testing exercise that will guide the long-term management of our pools. "The pricing regime for inland pools is broken", says Stephen Clarke, spokesperson for SMSPC. "It actively promotes disadvantage in Newcastle, and keeps us all from getting fair use out of these great public facilities that are mostly paid for through rates." SMSPC believes that current entry pricing contravenes Council's own Newcastle 2030 Strategic Plan, on several key objectives. And it points to many councils in Australia and around the world, who are providing more accessible public spaces to their residents through progressive pool pricing strategies. "These other councils are actually achieving the goals that our strategic plan is only talking about", said Mr Clarke. SMSPC is proposing that Mayfield Pool should operate at half-price entry for the next three years, to measure the efficiency gains in pool service delivery that could be achieved. "At the moment, Council simply doesn't know", said Mr Clarke, "because it has never tested the market with alternate pricing." Some question Council's capacity to reduce pool entry prices, given its current financial difficulties. But SMSPC argues that lower prices will allow Council to operate the pools more cost-effectively. "When funds are tight, Council should be trying to squeeze the maximum value out of its existing assets through increased usage", said Mr Clarke, "and this is exactly what lower entry pricing achieves." SMSPC believes that if successful, the exercise could become the model for other Council enterprises, paying rich dividends through better utilisation of public assets; higher levels of service delivery per ratepayer funding; and a healthier, happier, and safer community in Newcastle. Full details of the proposal can be found in the submission document. Mayfield Swimming Pool will be reopening for the 2013/14 season on Saturday 21st of September. So come for a bracing swim to celebrate the arrival of Spring as well as the International Day of Peace. With all those benefits - what better way is there to show yourself some kindness - come for a dip!! 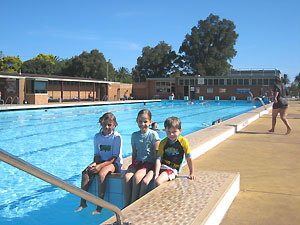 The Save Mayfield Swimming Pool Campaign (SMSPC) began in August 2007, when details of a council report proposing its closure appeared in the local media. We are a community group of local residents who are horrified at the thought that Mayfield might lose this historic and essential facility. We are committed to working with the council to help improve and promote the pool. As part of these efforts, SMSP operates this website to provide information to the community on the pool and the events surrounding it. With the help of many community supporters, we created and installed the beautiful tile Mosaic, and we regularly organise community events and entertainment at the pool. Our goal is to ensure the long-term viability and reinvigoration of the pool so that future generations of the local community will continue to have their lives enriched by it. Please contact us on mayfieldpool@gmail.com for more information, or if you would like to join us in our efforts!